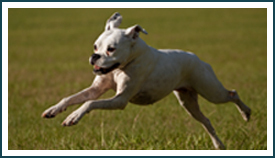 There is a great deal of misconception surrounding the white Boxer. 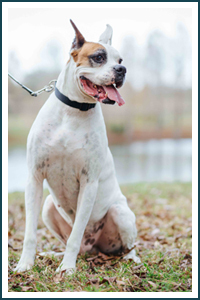 We have put together the following to educate our potential adopters or anyone else who is interested in white Boxers. Many of the original Boxers were white and could be registered in Germany until 1925. Difficulty arose in using white Boxers in police work, as they could be seen at night. For this reason Germany eliminated the ability to register white dogs and some breeders began to kill white puppies. This was the start of the controversy surrounding white Boxers. White Boxers are NOT rare. According to the American Boxer Club, they make up 25% of all Boxers in the United States. What makes seeing white Boxers somewhat unusual is that for a long time, the white puppies were not allowed to live. FBR believes that white Boxers have as much right to life as any other creature already born, and the occurrence of white Boxers is common enough that you will always be able to find one if you wish. White Boxers are not albinos. Some white Boxers have color on their coats or spots on their skin and all white Boxers have pigment in their eyes, therefore ruling out albinism. Although there is a higher incidence of deafness when a Boxer is white, not all are deaf. Deaf Boxers can be trained using a variety of methods including American Sign Language, hand signals, flashlights and more. Not everyone has the temperament, or the time and situation to deal with a Boxer who requires extra attention. This is not always bad, but they should know themselves well enough not to take on this challenge if it is too much for them. The same can be said for anyone considering having any pet, hearing or not. However, if you feel up for a challenge, a deaf Boxer may open up a new window in your life that you never dreamed possible. It doesn’t take a hero to live with a non-hearing Boxer. All it takes is a little time, patience, observation, and a kind heart, along with good basic common sense. Other dogs will know there is something different about deaf dogs and they will look out for them. You will realize the simple things you do with a hearing dog can become dangerous for a deaf dog, such as a dog that doesn’t want to play and starts growling and snarling, walking off lead, and cars. While deaf dogs will not be able to hear, they rely on their other senses, like smell, sight and touch. Those who have owned deaf dogs would not hesitate taking on the responsibility of a deaf dog; as many have found them to be easier to train than hearing dogs. There are no outside sound distractions as they cannot hear, and they watch for your signals, they prefer to be close to you, and will follow your lead.